VHT is a body balancing modality, which assists the body in achieving homeostasis which is the ideal situation for self-address wherein the body may positively look upon any unwanted trauma, structure or disease with a view to correcting it. VHT is a postural alignment modality in that after a session many clients notice the positive change in their posture. 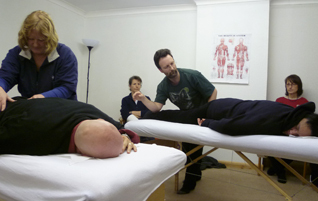 VHT is a myofascial release modality in that the moves are carried out over meridian chains of the body. VHT is a trigger point modality in that work is done over specific areas of the body to release trauma held in the fascia. VHT is part of a family of modalities which includes 'Equine Touch' for horses and 'Canine Touch' for dogs. Welcome to the VHT World website, here you can find out about VHT, what it is, how to learn it and how to find a Practitioner in your area. How can I learn VHT? VHT is one part of a family of modalities including Equine Touch (for horses) and Canine Touch (for dogs). There are very strong links and similarities between all three disciplines and they evolved form the same starting point. Many students decide to train in more than one modality, so helping more people and animals. Learn about the other modalities on their separate websites, see the links above. IETA Conference – The Best Ever!